(Host) One-hundred years ago, the Green Mountain Club was founded and construction of the Long Trail began. VPR is looking back this month at how the hiking trail has influenced the history and culture of the state. Today, VPR Commentator Tom Slayton introduces the early leaders of the Green Mountain Club. (Slayton) In 1915, the Green Mountain Club, barely five years old, was in trouble. Its founder, James Paddock Taylor, had withdrawn from active participation because he felt that the club’s purpose, building The Long Trail along the crests of the Green Mountains was pretty much fulfilled. But those who actually hiked on the Long Trail were not so sure. A misguided deal with the state Forestry Department had produced a huge section of the trail south of Camel’s Hump that was not only hard to follow, but boring as well. The Forestry Department had cut 70 miles of trail down the center of the state that was actually designed as a fire prevention trail: no grades exceeded 15% and most of the scenic peaks of the high Green Mountains were avoided. This was not the sort of trail Green Mountain Club members had envisioned when the club was founded in 1910! A sense of apathy and despair permeated the club and in 1916, it actually considered the possibility of disbanding. But then a shaggy, mountain-loving retired botany professor from Montclair, N. J. appeared, and things began to change. 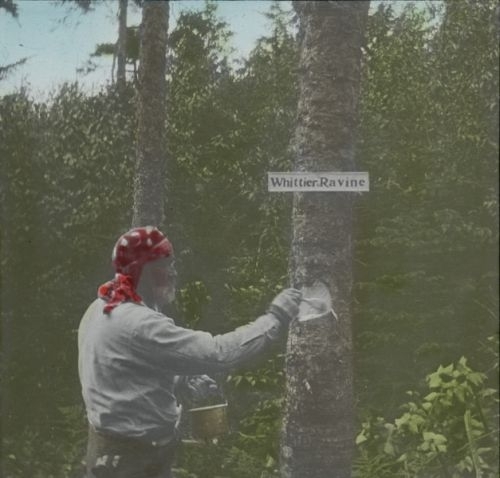 Prof. Will Monroe, eccentric lover of dogs, passenger pigeons, and mountains had moved to Vermont, and saw that the club was dissatisfied with the trail it had inherited from the Forestry Department. So Monroe, with typical directness and energy, began cutting a new one. Green Mountain Club executive director Ben Rose sees in the photographs of Monroe an active trail builder who might be recognized by today’s hikers as one of them. (Slayton) Instead of the timid grades and deep-forest routes favored by the earlier trail, Monroe blazed his trail directly over the highest crests of the Green Mountains. He turned out to be a natural genius at trail construction, scouted the woods and found the most interesting glens and overlooks, caves and springs and routed his trail to connect them. The resulting 50 miles of trail is both rugged and beautiful. Some hikers today consider the Monroe Skyline the most challenging section of the Long Trail and the most aesthetically pleasing. In “Forest and Crag,” their classic history of hiking in the Northeast, Laura and Guy Waterman declared that the Monroe Skyline Trail, as it came to be known – was and is “a classic etc…”. Ben Rose says Will Monroe was about as different from the Green Mountain Club’s founder, James P. Taylor, as can be imagined. (Slayton) There were several other important early leaders in the early days of the club – Judge Clarence Cowles, Louis Paris and Herbert Wheaton Congdon, all hardworking trail builders. Ben Rose says there was also Theron Dean, a talented amateur photographer who created a magic lantern slide show to publicize the club. 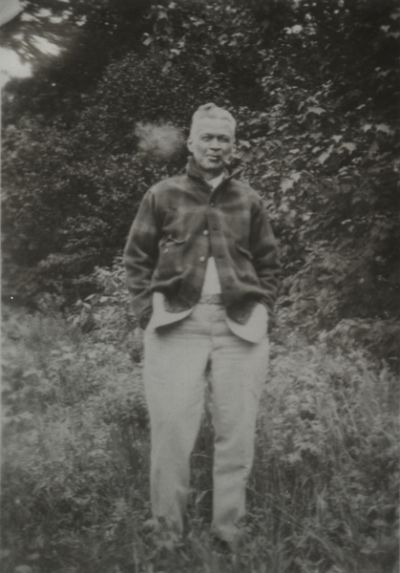 (Slayton) Hiking in those days was becoming a fashionable activity, and the founders of the Green Mountain Club were the leaders of Vermont itself in the 1920s and 1930s. Some, like Taylor, were promoters and idea men. Some, like Will Monroe and Judge Cowles, were trail builders. But together, they changed the way Vermonters thought about their mountains. And those early Green Mountain Club leaders established an organization and an outdoor ethic that changed Vermont. And that continues to this day. My grandfather was a founding member of the GMC. You can probably guess who he was based upon my first name. He passed when I was about 8 so I never heard about Thendara until my son in NYC said he was thinking about buying a house in LT and I did a web search. He wants my wife, Julie, and I to come up and look at houses with him. We are looking forward to visiting the club and meeting some members. People loving nature are a good group of people. Maybe the best.